At Aberdeen Proving Grounds (APG), the Department of Public Works (DPW) operates and maintains 3,300 facilities, structures, utilities, roads, land and over 40,000 pieces of equipment in over 30,000 separate locations. DPW serves over 80 Garrison Supported Organizations (GSO) consisting of about 20,000 civilian and military personnel and over 16 million square feet of space. DPW provides facility operations and maintenance, design, construction, utility and energy conservation, recycling, solid waste management, custodial services, landscaping, and environmental, safety and occupational health. Base Realignment and Closure (BRAC) had a huge impact on APG and specifically the CADD and the Facility Management System (FMS). Associated with these facilities are over 7,000 engineering drawings and an estimated 40,000 real property equipment items requiring tracking, preventative maintenance, repair, and replacement parts. As a result of this project, several items must be tracked, captured and managed including scheduling of Preventive and Corrective (P&C) tasks, completed P&C actions, materials and parts used, time and cost, etc. The PMWOM process allows DPW to track issued work orders through to completion. This project updated issued work orders, tracked and captured completed results of PM, and input data to the FMS and GFEBS systems. The Team also managed and tracked warehouse inventory for parts and materials required during P&C maintenance. • Captured, tracked, managed, and updated Preventive and Corrective Work Orders through FMS & GFEBS. • Managed data extracts from GFEBS to FMS for Work Orders (job plans, frequencies, parts/materials). • Tracked material movement through FMS and GFEBS MIGO transactions. • Setup and organize parts and materials warehouse. 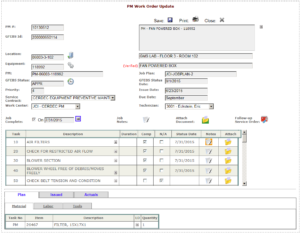 • Updated FMS to include Warranty and Parts & Material Inventory Management. • Developed process to capture, track, manage and update Tenant funded PM actions.